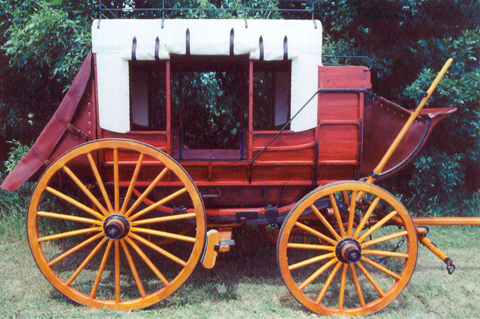 One of the most recognized and celebrated western vehicles is the stagecoach. Built to take on the toughest terrain, these graceful works of art are well known for their historic part in the development of America. Lighter than the heavy Western Concord Mail coach, this particular set of wheels is more commonly referred to as a mud coach or mud wagon. With room on top, it was designed to seat as many as 12-18 passengers and was built to travel over some of the steepest, roughest, wettest, and most unimproved trails. In addition to the lighter design, mud coaches differed from the Concords in that the sides are straight, the body rests on iron rockers that sit on leather thoroughbraces, and the roof features a heavy canvas covering. 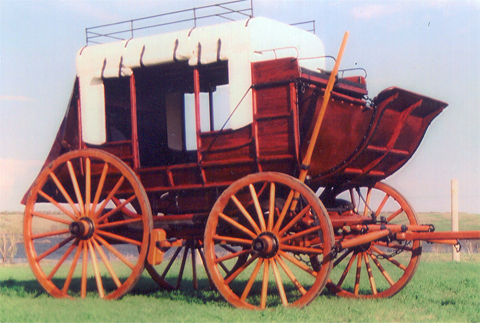 Believed to have seen service in Wyoming, this coach has been dated to the 1870’s. It still includes its original serial number, 12838, from the legendary Abbot-Downing shops in Concord, New Hampshire. 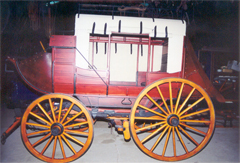 This coach is now located in Minnesota and is occasionally driven and displayed as a modern day tribute to the legacy of the Old West. 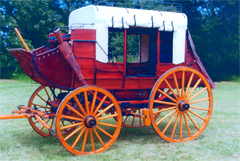 It was fully restored in 2000 by Hansen Wheel & Wagon Shop in Letcher, South Dakota. 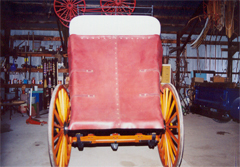 Doug Hansen and his family of exceptional craftsmen are well known artisans in the authentic manufacture and restoration of horse drawn vehicles.